WE'VE ALL SEEN those glorious posters of the snow-peaked Himalaya Mountains. Now imagine a steam-powered train chugging up steep grades through quaint villages with The Himalaya as a backdrop. This is exactly the scene that awaits you in FAMOUS LAST LINES. 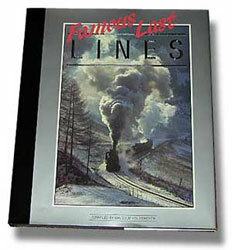 Here’s the book National Geographic would produce if it published coffee-table railroad books. Assembled by Malcolm Holdsworth, the works of 11 Australian photographers are dedicated to conveying the character and landscape of five famous last steam lines. Along with India’s Darjeeling Himalayan Railway, you’ll marvel at Austria’s Iron Mountain rack railroad in the throes of winter operation. You’ll be mesmerized by the verdant glories of South Africa’s Garden Route, with its Garratts and torpedo-tender 4-8-2’s. You’ll be entranced by the majestic isolation of the Esquel line in Argentina’s Patagonia, a slim-gauge empire that rekindles the aura of the bygone Colorado and Nevada narrow-gauge lines. And of course, you’ll be treated to a renowned section of track in the Aussie’s own backyard, the Sydney-Newcastle “Short North,” home to a fascinating variety of power from turn-of-the-century tank locomotives and Consolidations to the world’s largest Garratts to streamstyled Pacifics on the Newcastle Flyers.